Download the multi-member LLC operating agreement that is to be written for any company that has formed, required for the States of California, Delaware, Maine, Missouri, and New York, to set the rules and conditions as to how the business will be operated. In order to best enter the correct details for the company, the information entered into the agreement should be from the Secretary of State’s office by looking up through their corporation/business entity search. This form should contain the owner’s information (known as ‘Members’), registered agent, business purpose, management (member-managed or by a manager), capital contributions of each individual, time required to be spent on the company, and any other details needed as necessary. Download the document and begin filling-in on your computer or by hand after printing. Step 1 – Header – Enter the State where the LLC is located followed by the formation date and the members’ full name. Step 2 – Section 1.1 (Formation) – Enter the effective date (month, day, year), the company name, and the State laws are pursuant. Step 3 – Section 1.2 (Name) – Company Name. Step 4 – Section 1.3 (Purpose) – The lawful purpose and the State. Step 5 – Section 1.5 (Registered Agent) – Enter the full name of the registered agent and the address. 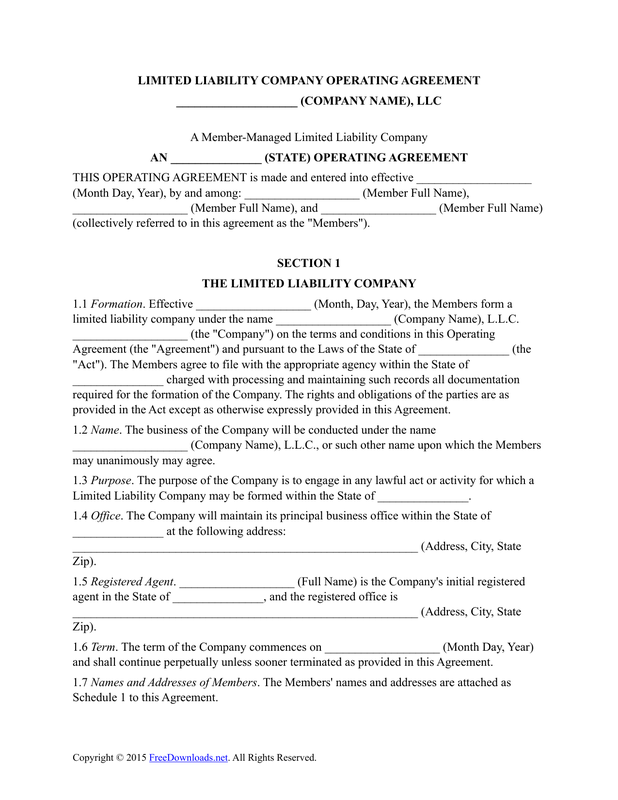 Step 6 – Section 1.6 (Term) – Enter the date the LLC was formed. Step 7 – Section 10.2 (Governing Law) – The State of Governing Law. Schedule 1 – List all the members of the company. Schedule 2 – List the capital contributions (investments) made by all members. Schedule 3 – Enter the valuation of all the members’ interests. Notary Acknowledgment – Before signing any part of the agreement it should be signed in the presence of a notary public.